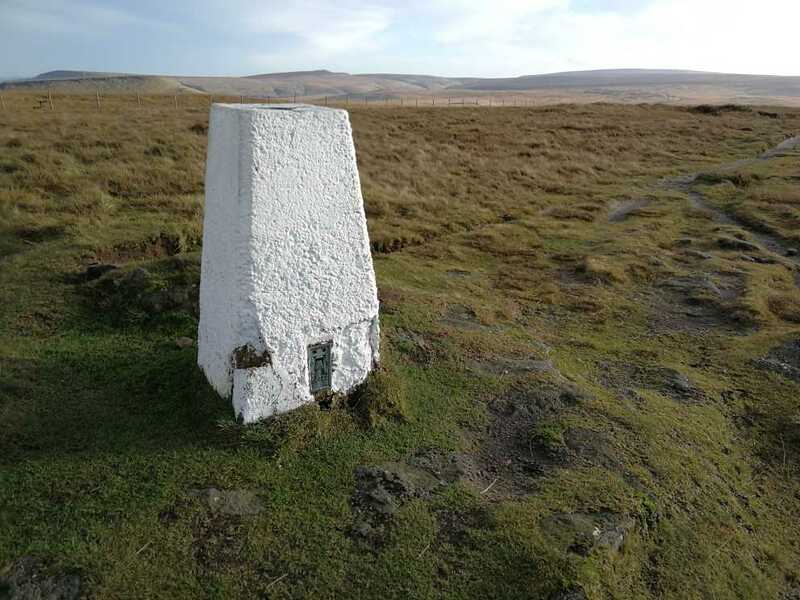 Despite the white paint the trig is in bad condition. All four base corners have chunks missing. Spider intact, Cap missing. 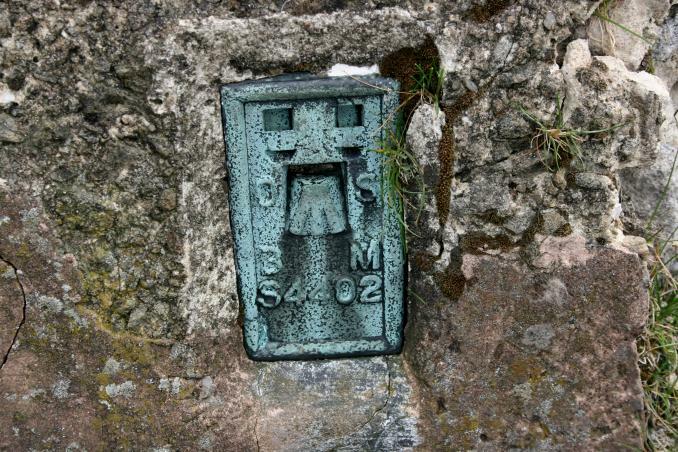 The bottom left chunk is loose and will end up vandalised. Awesome views. Magnificent views. Blowing a gale as usual and ice cold. Spider intact. Cap missing. Badly damaged. Access from the South heading up the PW. 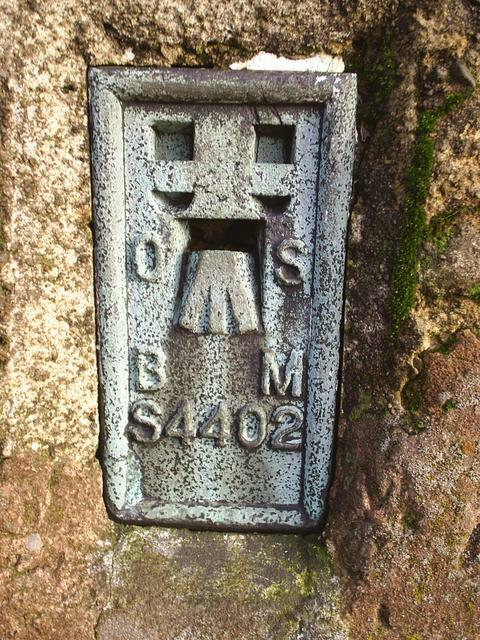 passed this trig back in 2004 when coming down the PW. 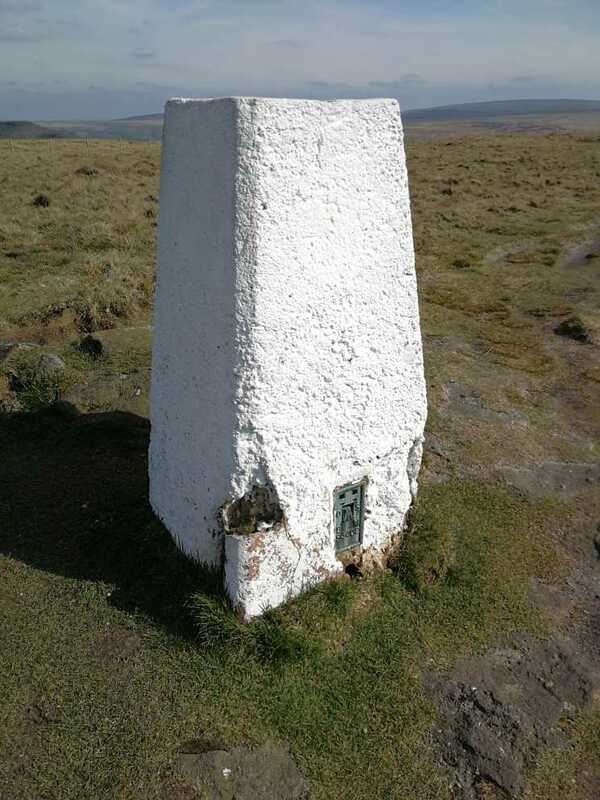 (pre logging trig days) Recent fresh white coat of paint. 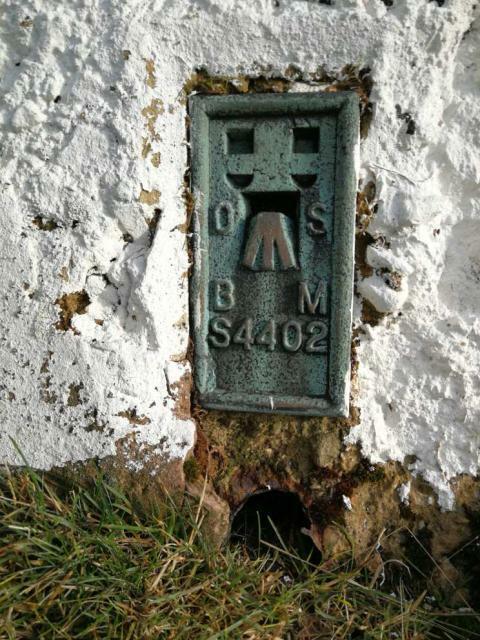 Plug missing but all other metal work intact. Reasonable views but a little heat haze for the bigger distances. 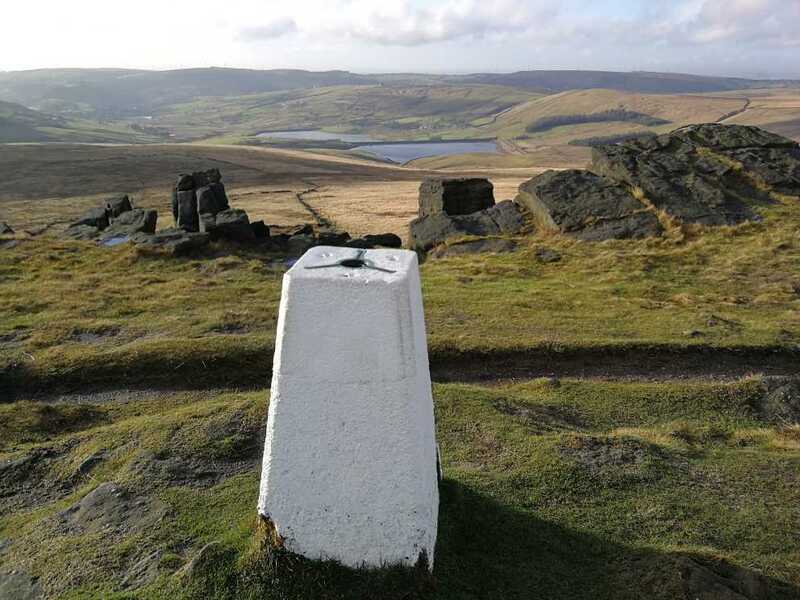 certainly note the recent moorland fire damage out on Saddleworth moors. 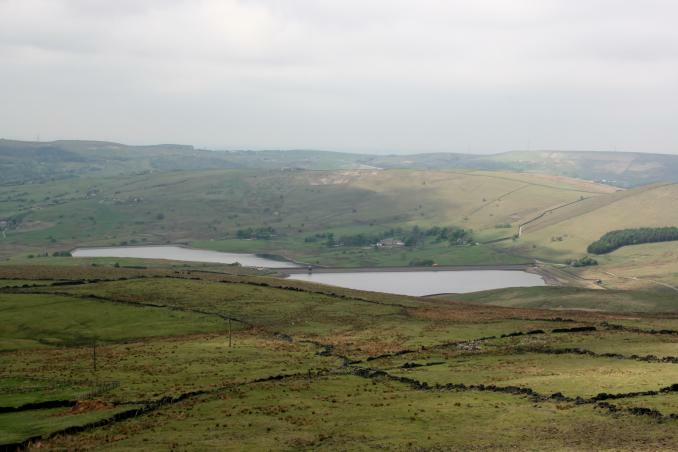 most of the reservoirs in view looking somewhat depleted. 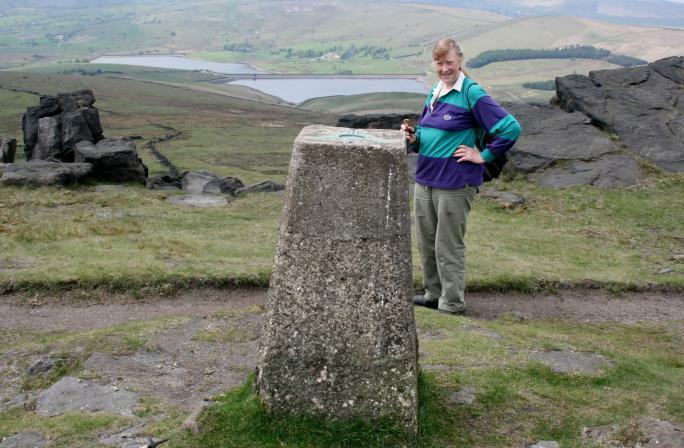 Walked up from brunclough Reservoir car park. Damage to three bad corners, one corner substantially. 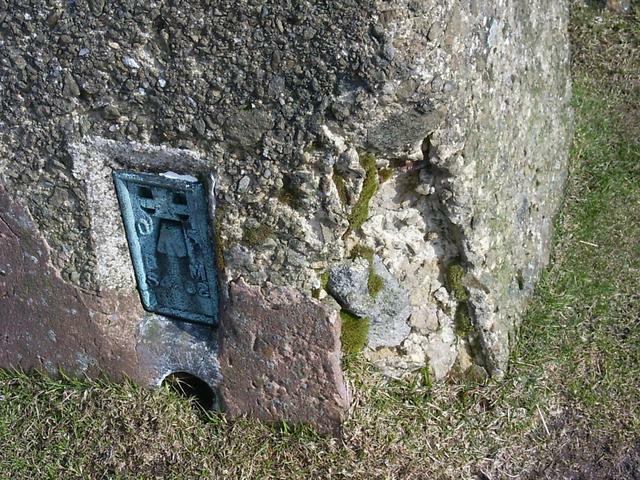 Top third has different concrete as can be seen in the picture and is not the original build. Spider intact. Plug missing. 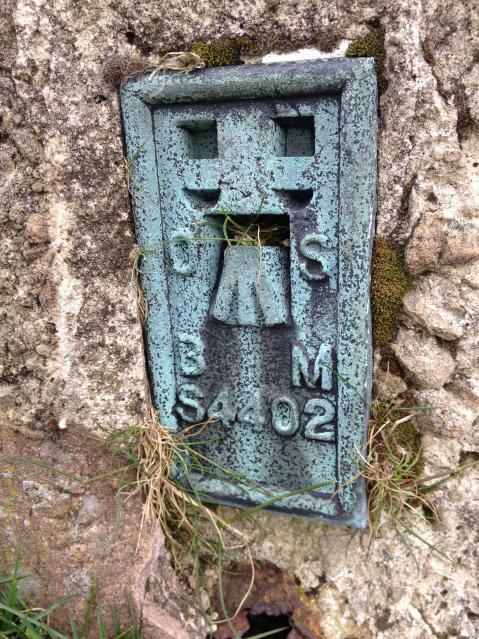 Don't miss the memorial plaques down on the rock face in front. 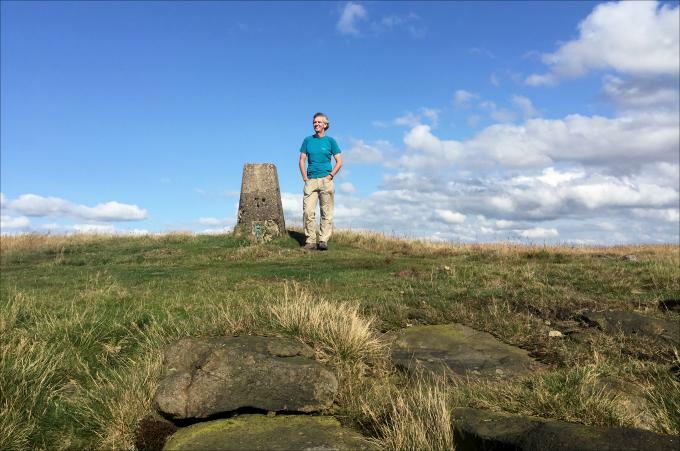 On the start of a basking walk from Standedge and into Lancashire and the M62 mast, back via the reservoir routes and the impressive Roman fort at Castleshaw. Stop at Ram's Head for a T Taylor much needed. 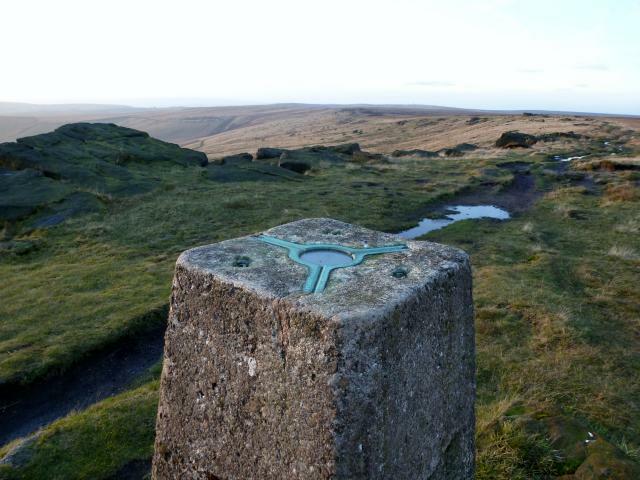 Circular walk from Hey Green. 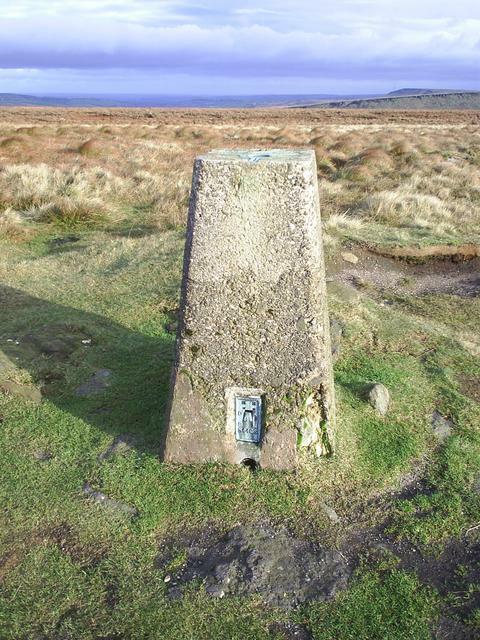 Pule Hill, trig, then down packhorse road from Broad Wham. 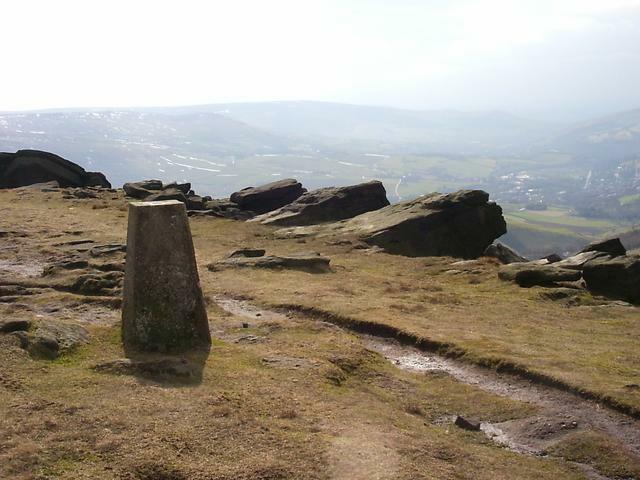 Cloudy at first, sunny later, good views from both hills. Went on dark. Very cold day. 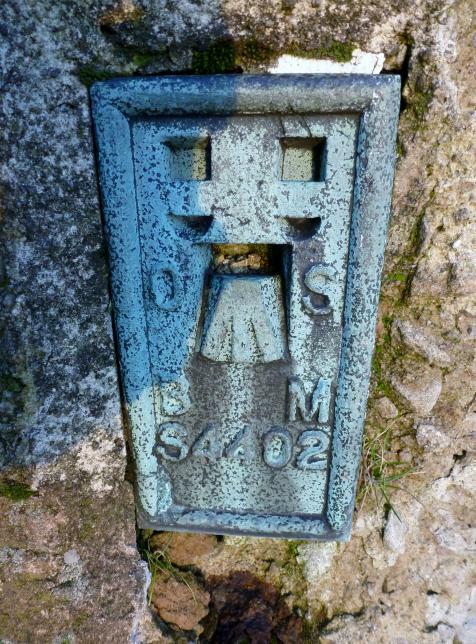 Close up of TP6152 - Standage Close up photograph showing condition of trigpoint. 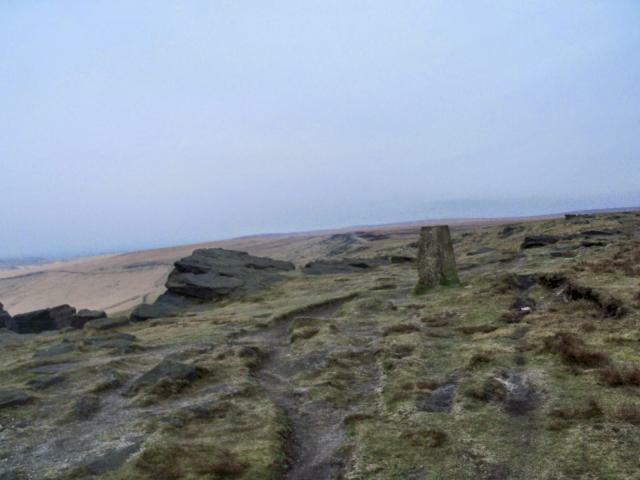 Walking Pennine Way heading north was very misty no views . Plug missing. 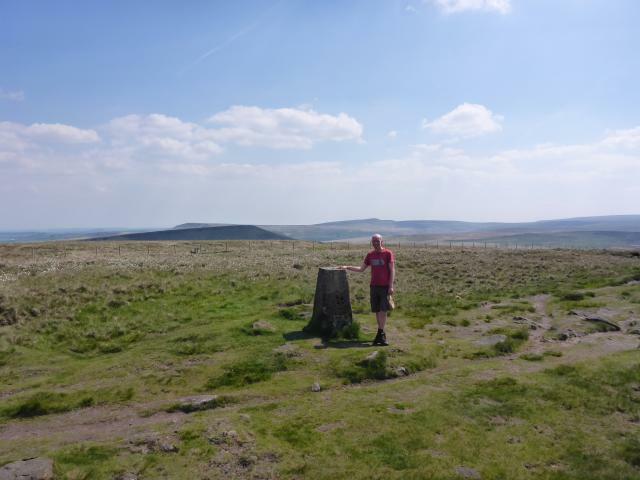 Good views to the west - as far as Cheshire Plain, Fiddlers Ferry etc. Weather a bit grimmer to the east - a reversal of normal conditions. 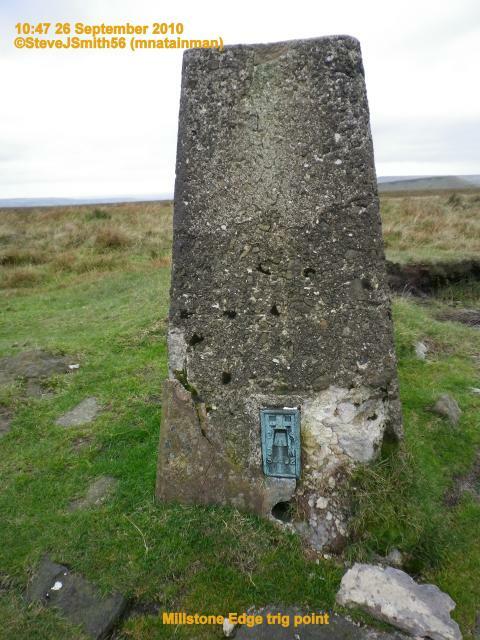 Parked at top of Manor Lane for easy walk up past farm to join pennine way. Nice open spot with good views. 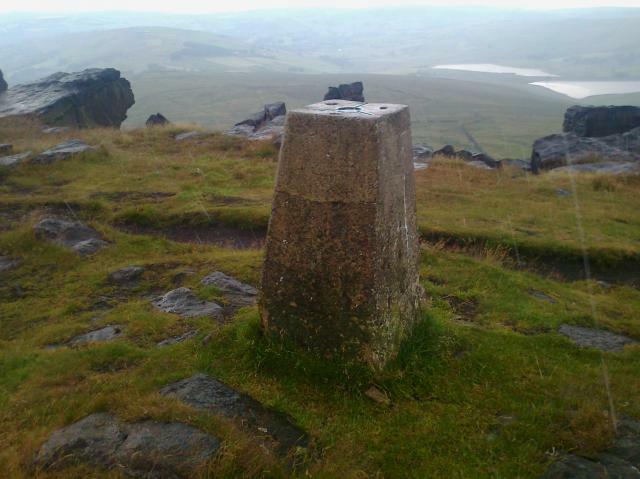 On Pennine Way, bit breezy and cloudy but not bad really. Great views. 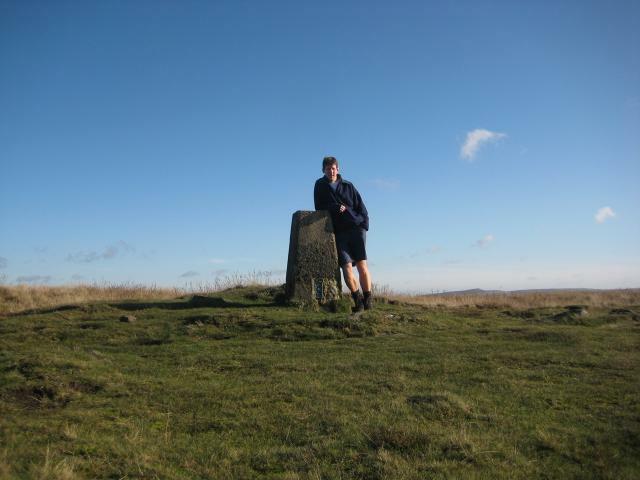 From south on Pennine way then bagged the deleted Tump Ox Hey Top. 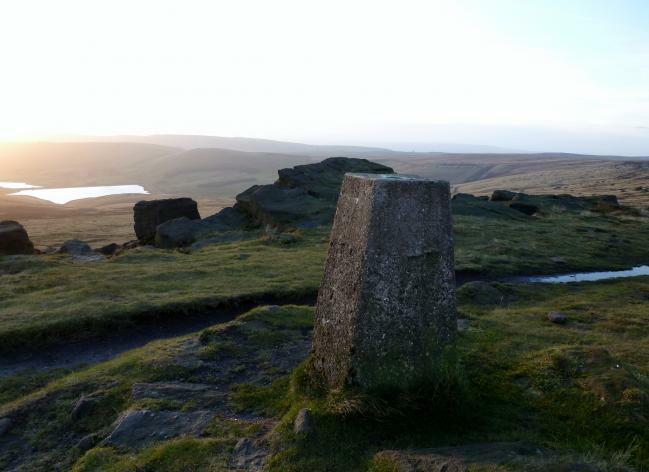 Having had one of the best fish and chips I've ever had in Meltham, I rode a bit of a loop out to South Croslandand Holt Head to reach Marsden. Used main road for climb, but very little traffic. 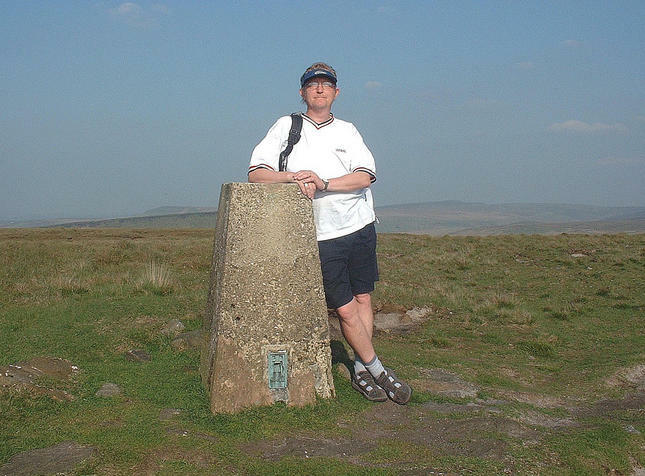 Left bike to stroll up Pennine Way to pillar. Length pause at top to enjoy the day. 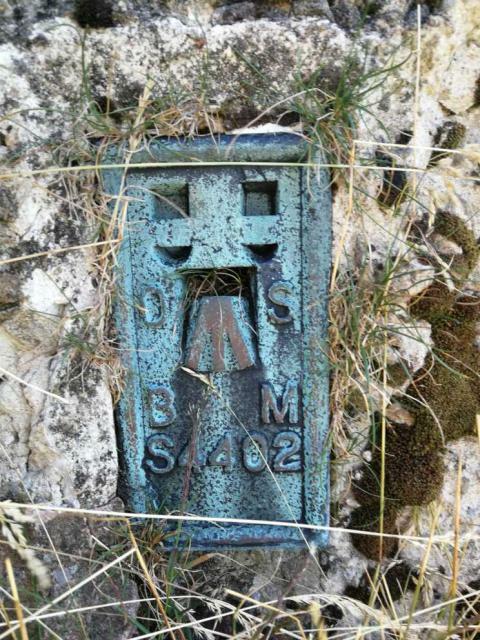 I walked up from Marsden train station fantastic 360 views. 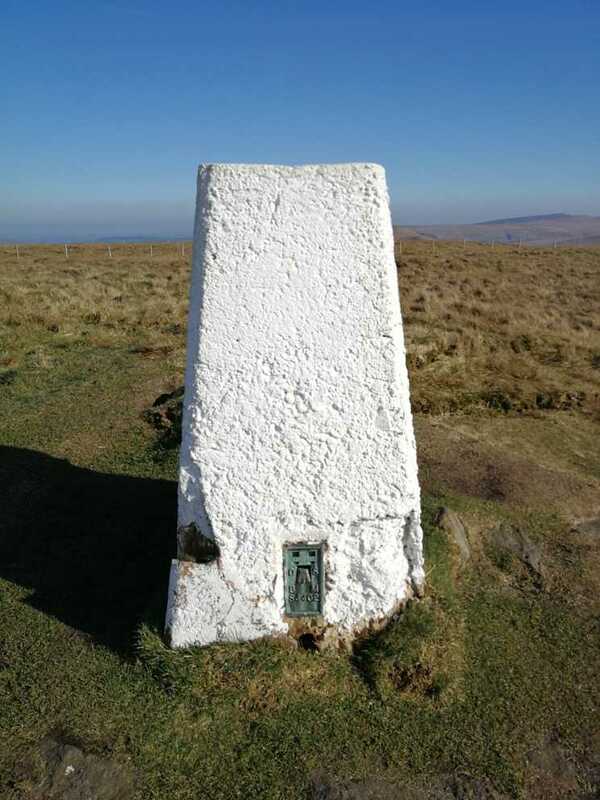 Have walk past this trig on several occasions,the 1st time was 27th May 1989 whilst walking the Pennine Way,been back today to take photo and can now log my visit. 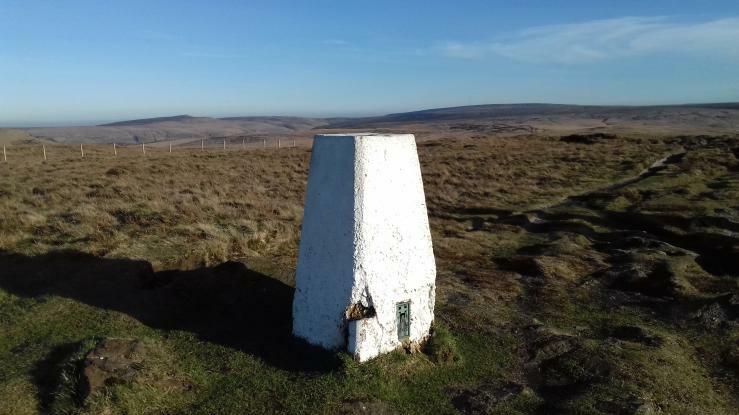 The trig is on the well maintained Pennine Way and can be reached in 20 minutes from a carpark nearby, off the A62 (Huddersfield Road). 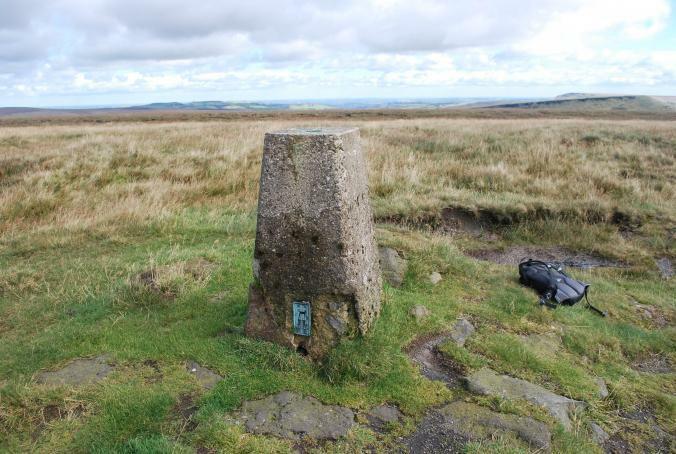 Beside pennine way, with good views over the valleys. 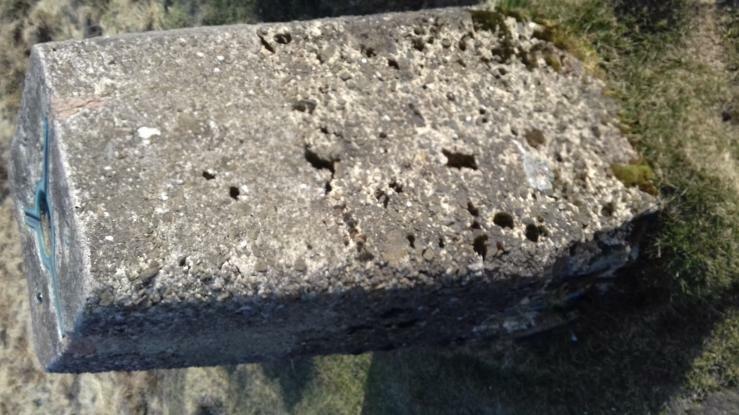 Pillar has a bit of damage around its base. 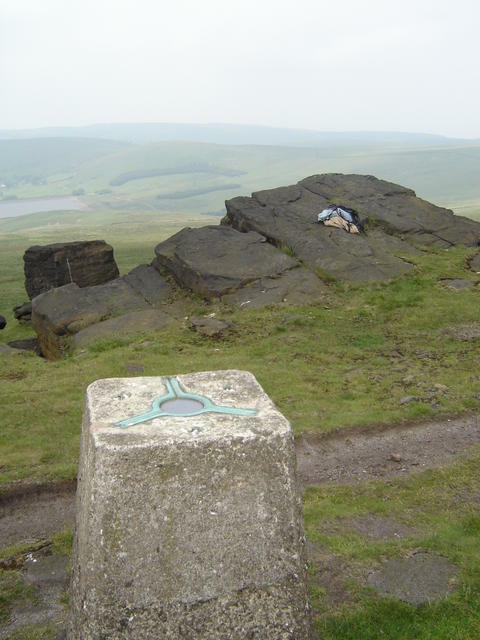 Pathfinder Guides - Peak District Walks (2008): Marsden & Standedge. Been saving this one so as to coincide with the heather only to discover this was just grass moorland !! Not my most favourite scenery. 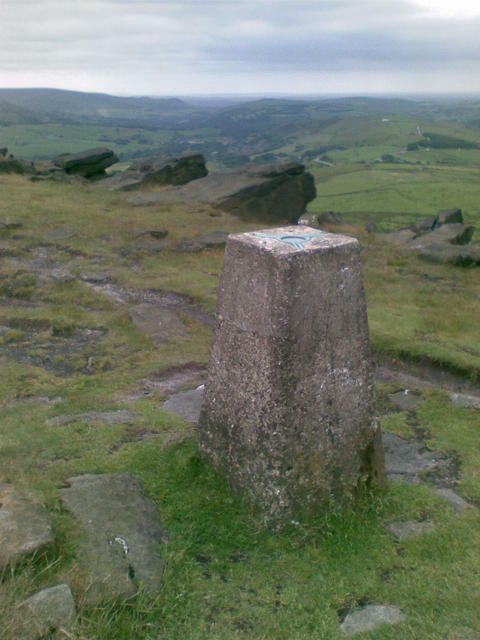 Standedge is frankly pathetic when compared to those of Stanage, Baslow & Curbar. 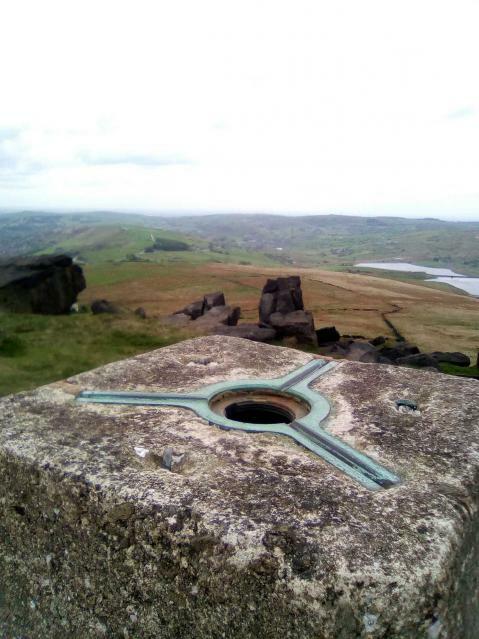 Views from the pillar are unremarkable except for those looking towards Diggle. 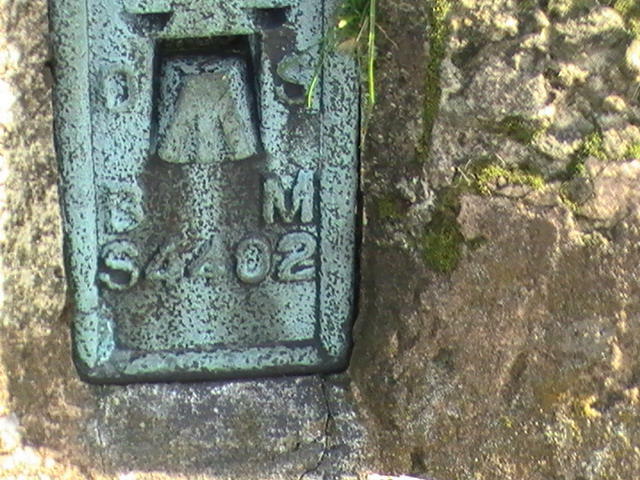 Pillar is damaged around base and cap has been replaced with a plastic disc. 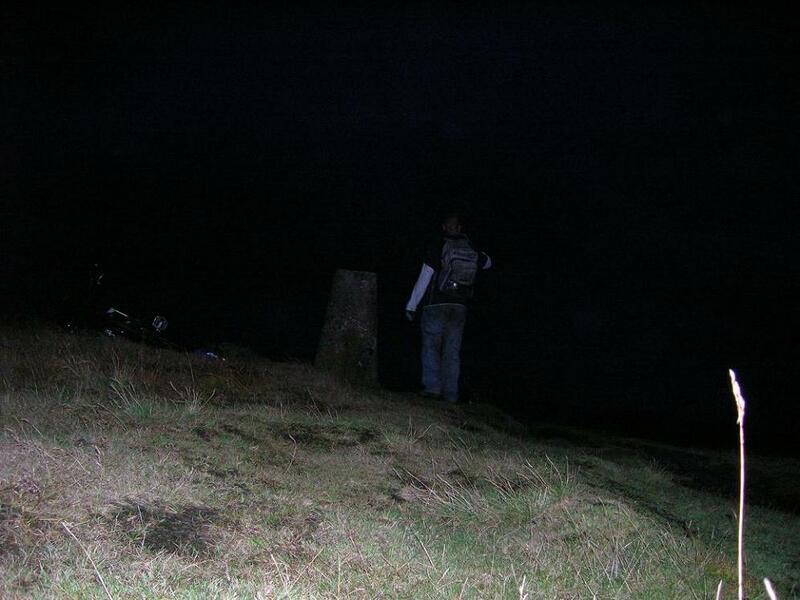 Views from Pule Hill were more inspiring. Nice location with good views. 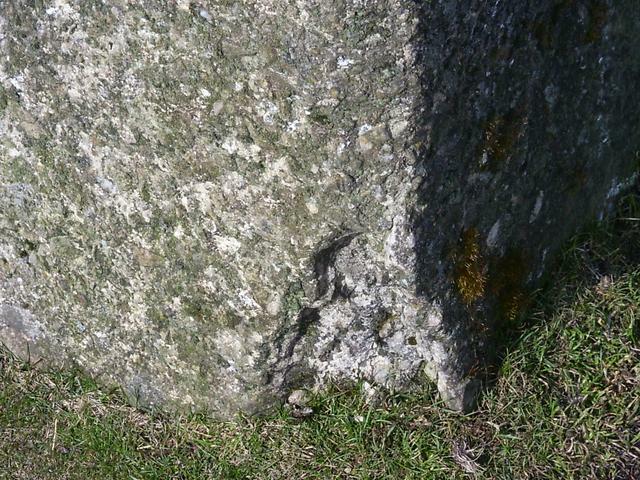 Pillar badly eroded at base. 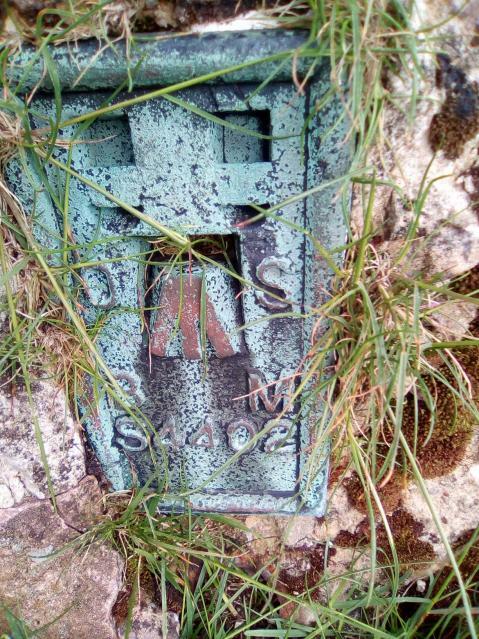 Walked from Marsden...a good day. First one, look forward to doing more. 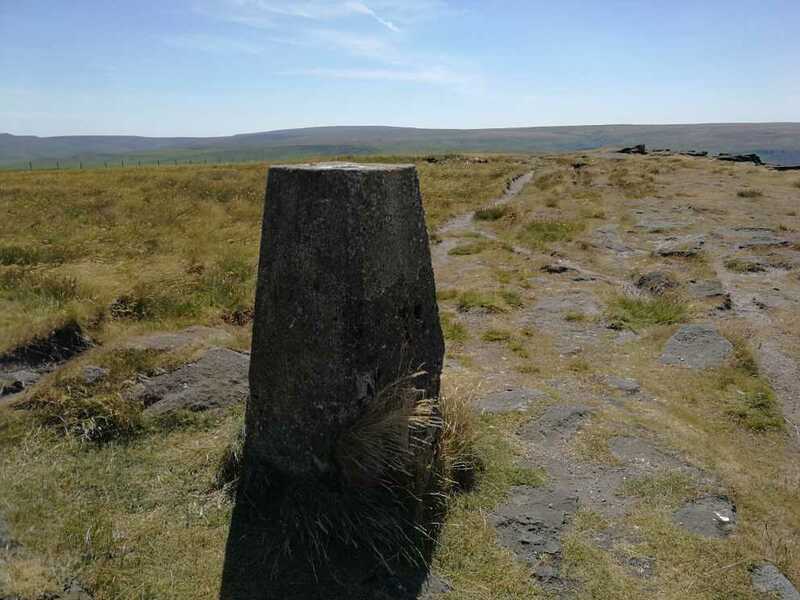 last of day walkers car park just of road followed pennine way track striaght to trig.Nice spot here great moorland views plus rock outcrops on ridge,trig is has a fair amount of damage plug missing. 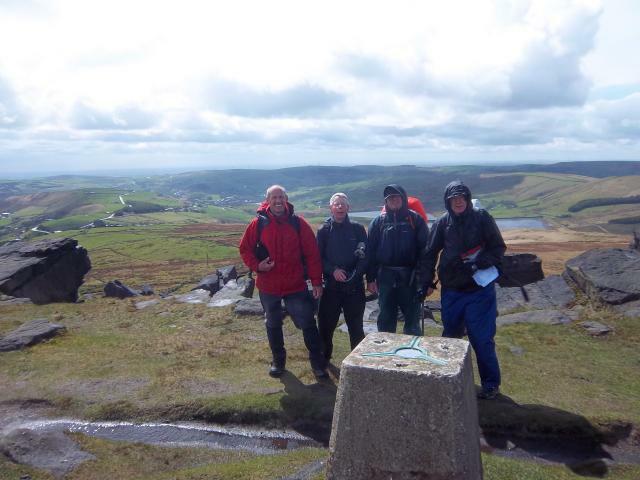 Visited whilst completing New Saddleworth 5 Trigs with Irregulars LDWA. Much surface concrete missing around FB. Plastic plug. Public. Access Land. 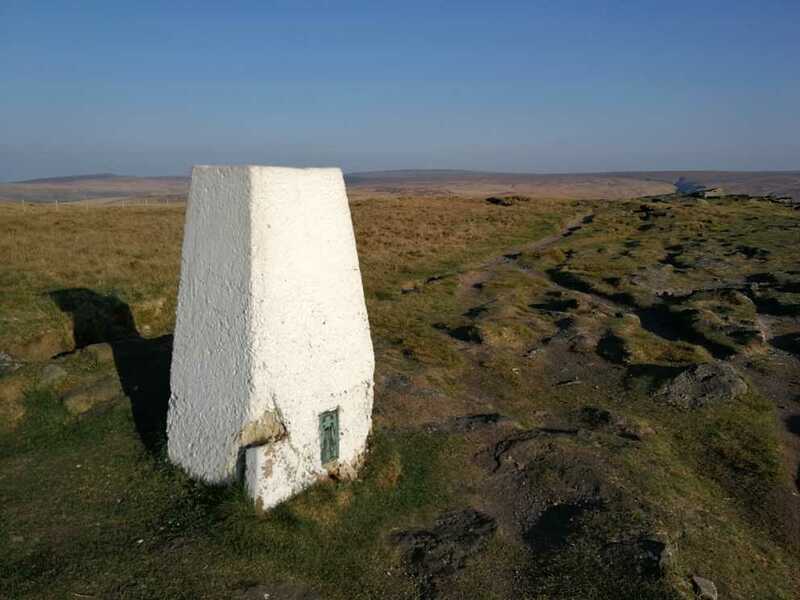 Right on Pennine Way a short walk from the Great Western [A62]. 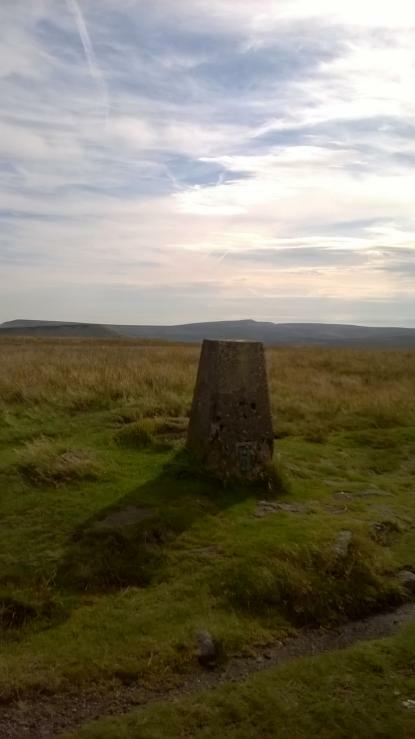 Wonderful moorland location, a great place to just sit & ruminate. Visited today whilst walking through. How can this be? Clockwise from the car park and down the lane - it seemed 75% downhill. Pleasant. 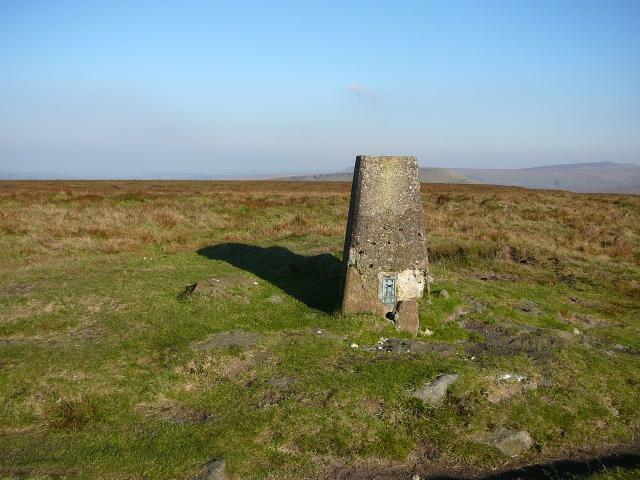 Circular walk from Greenfield via Broadstone Hill. Very windy day. Log #14. 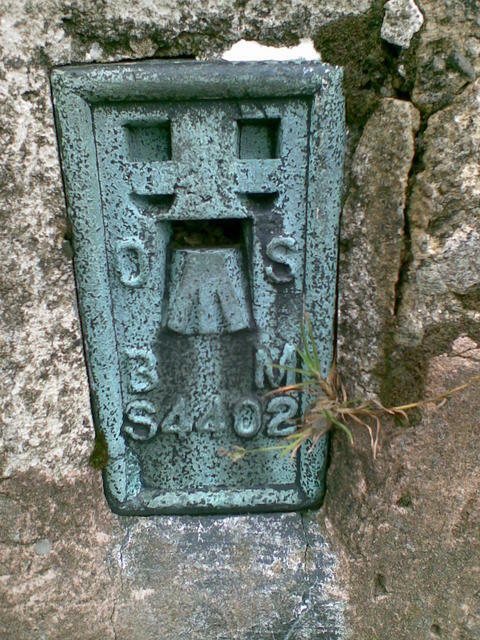 (448m). 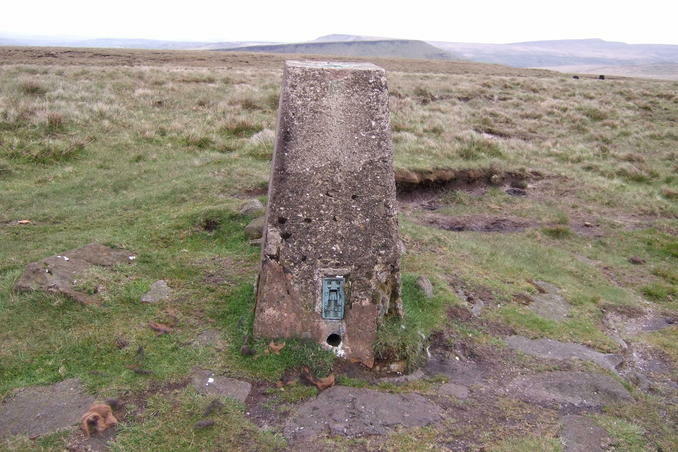 Bagged this one while doing the Standedge Circuit, an 18km circular walk from the National Trails Try-a-Trail Pennine Way Walks Series. 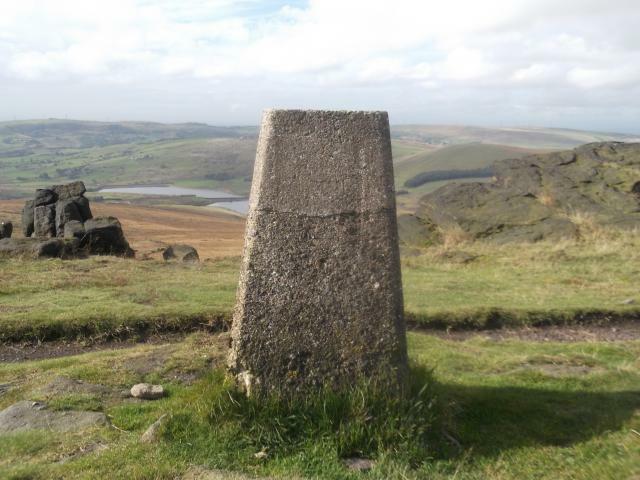 This one starts in Marsden and takes in 7 reservoirs. 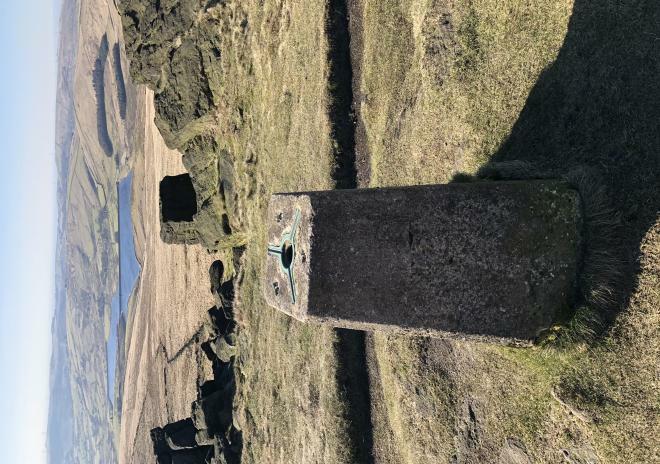 The day was fabulous, the weather, walk and views from the trig making for a very high score on this one. 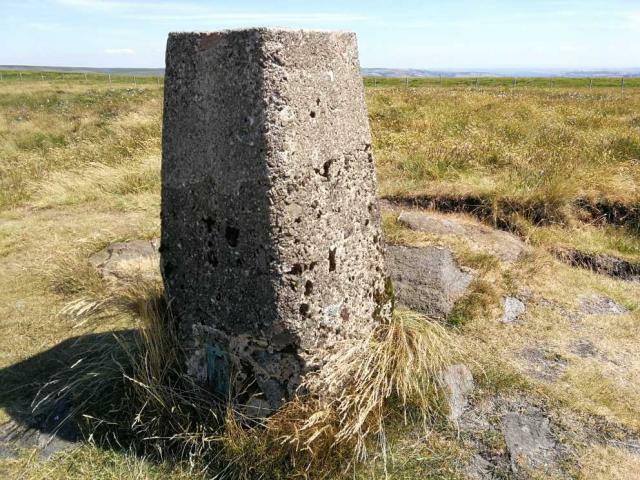 The trig is slightly damaged around the base. Jodrell Bank large telescope visible to the SW thru binocs - range 24 miles. 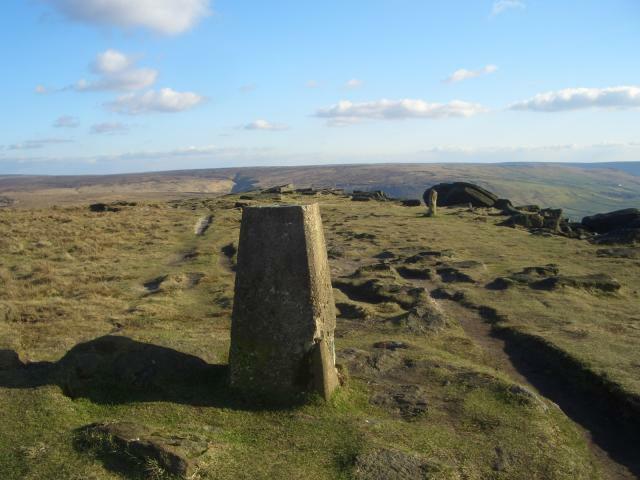 The sunshine and half term brought out innumerable walkers and school groups. What a view! 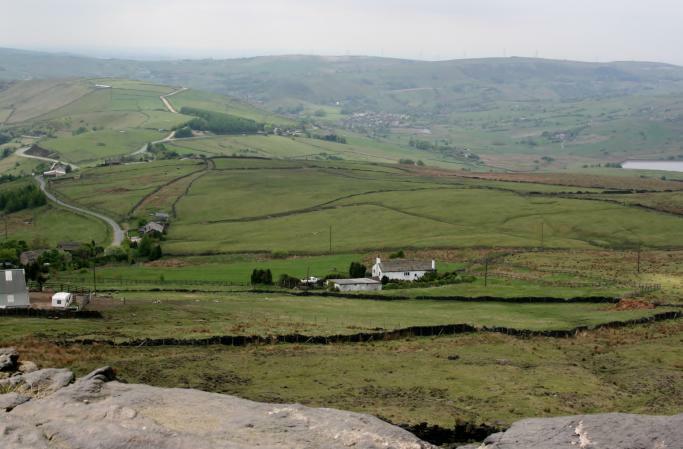 I can see why Ammon Wrigley, a local dialect poet, would have his ashes scattered here. 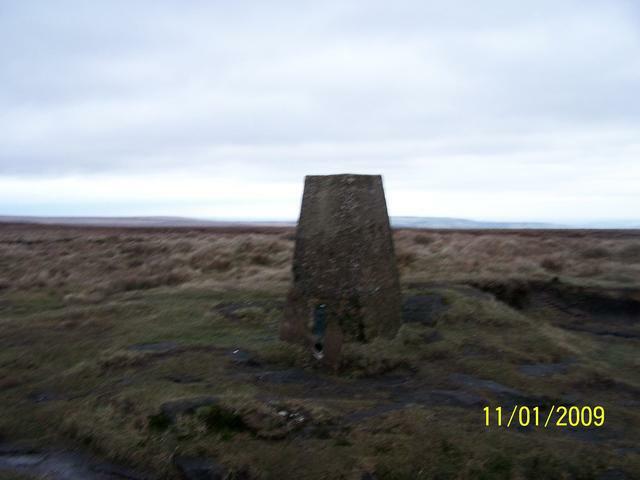 Trig has Slight damage to Base, Weather dry but cloudy. 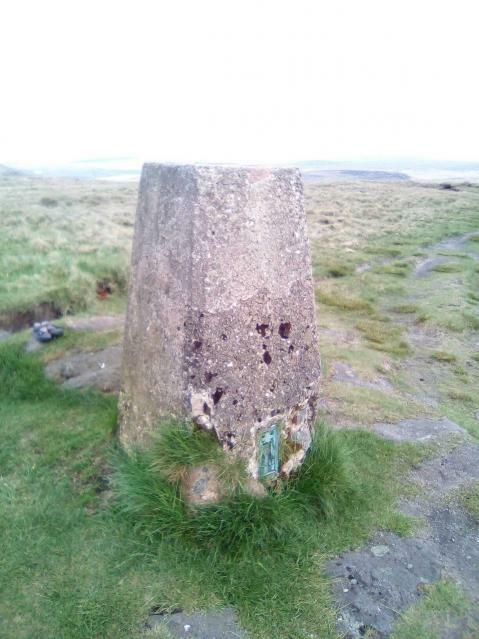 Parked at car park on A62.Short wak up to pillar on Pennine Way.Extremely windy day. 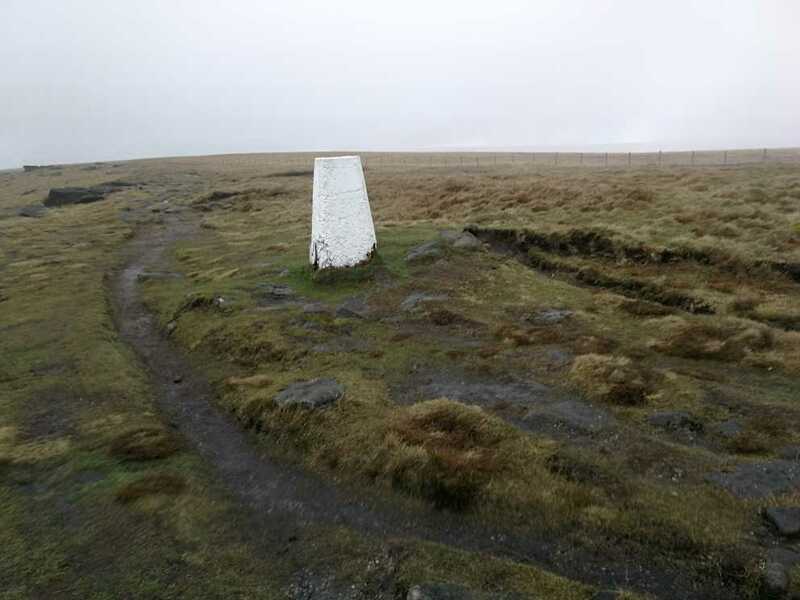 16 mile linear walk from Windy Hill to Crowden, bagged White Hill (Moss Moor) and Standedge trigs, the rain went mental between the two trigs but cleared up in the end, made it hard to ford the stream later on though. 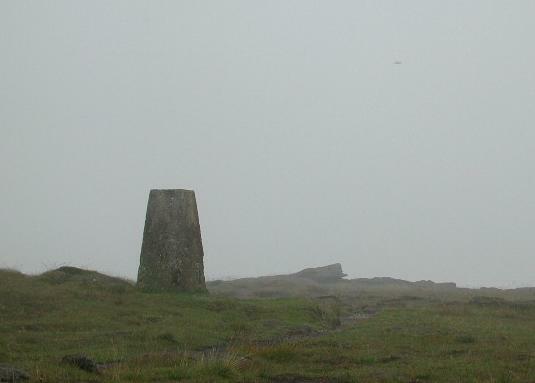 visited first on 27th so misty that I missed it, blowing a gale, raining and couldn't see a thing, fantastic up there. Had to go back Saturday when I could see :-). 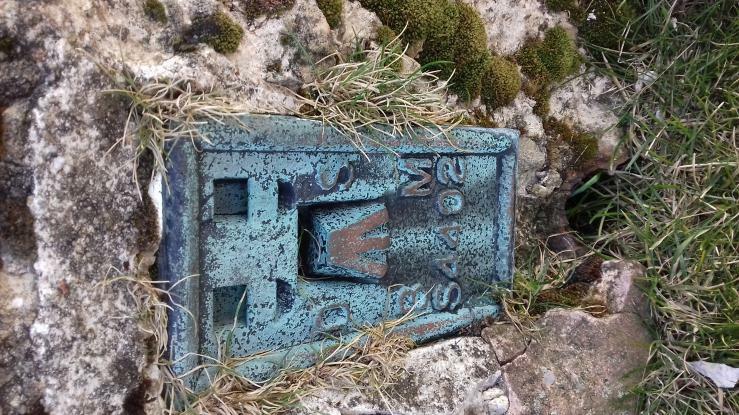 Trig is starting to break up along the previous reapairs at the bottom. 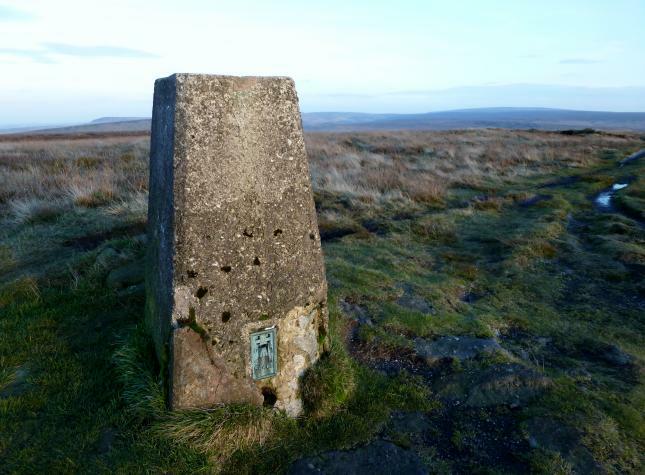 This trig needs somebody to look after it, like they have at Moss moor. 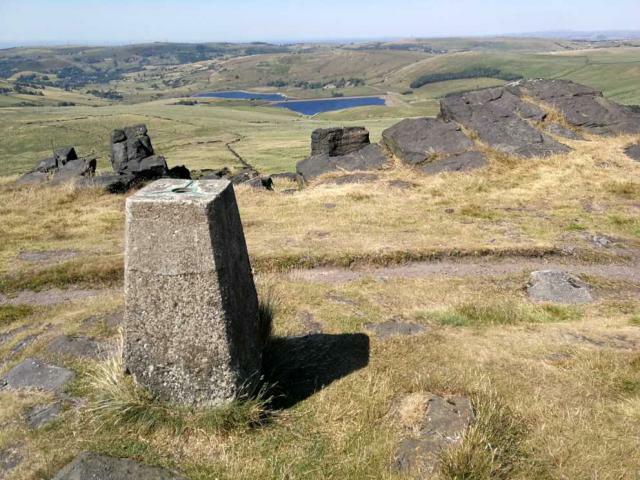 Nice spot on a walk from Marsden to Littleborough, nice day for it to! 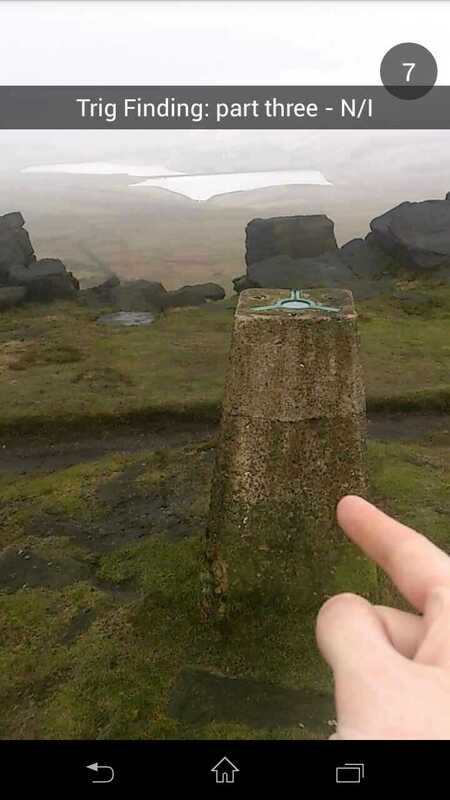 Very misty today with no visibility, quite a miserable visit to this trig with slight damage on all faces, although nothing like as bad as its nearest neighbour. Great spot. 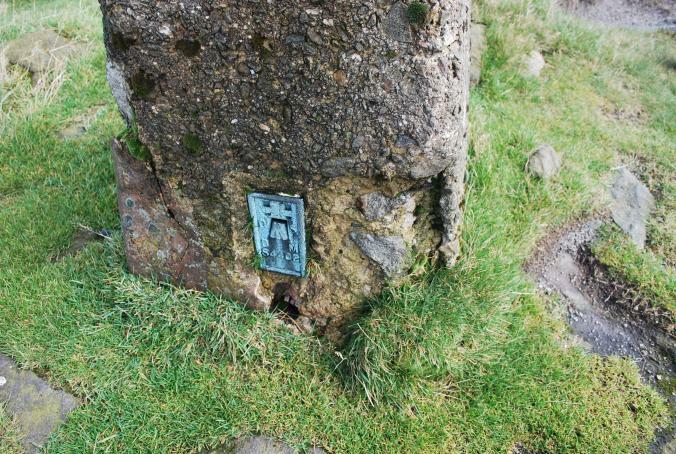 Look around for interesting plaque attached to nearby rock. 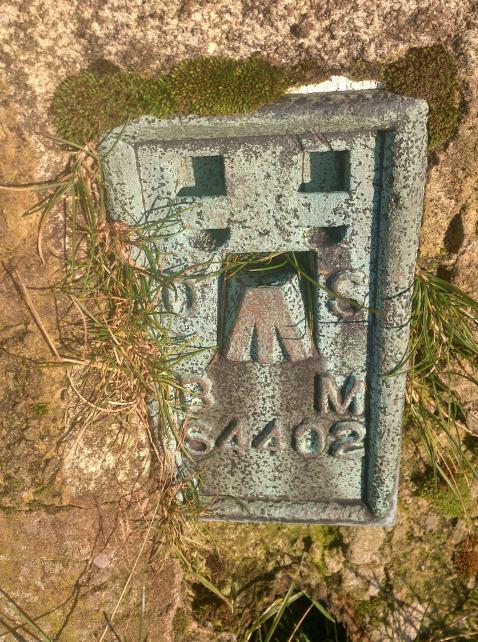 Found whilst out Geocaching nearby. 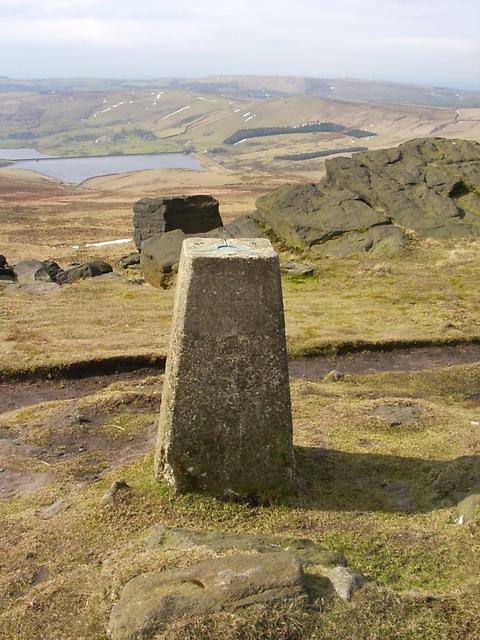 Easy 20 minute stroll from A62. 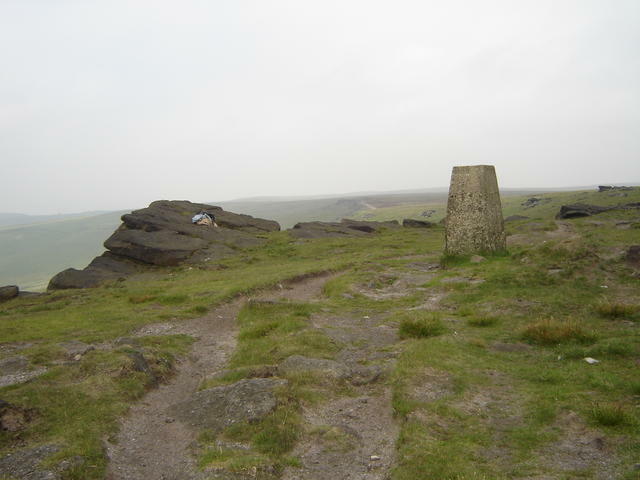 The car park at Standedge was closed - construction work. 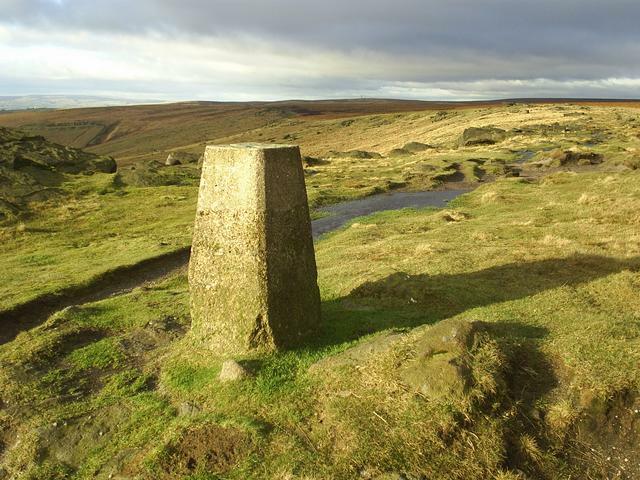 Combined with circular walk including Marsden and Tunnel End Inn. Brightened up considerably in the afternoon. 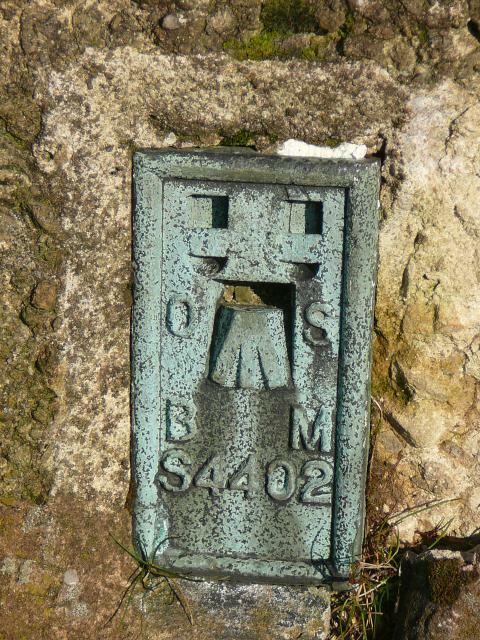 Gets proper windy on top of the hill that this is on. Good fun racing to it in the wind though. 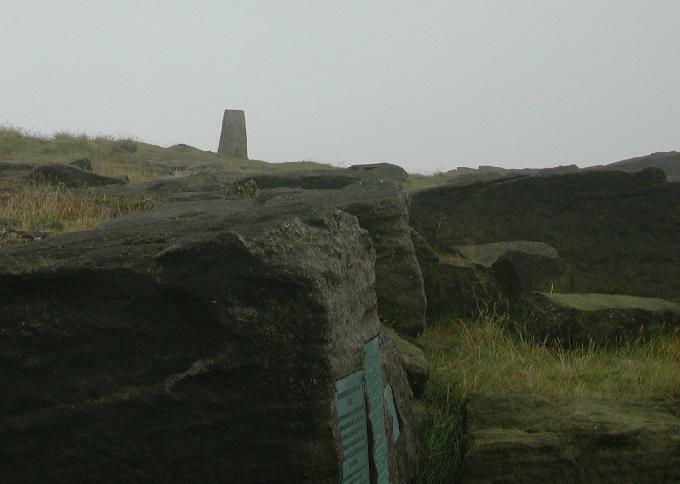 A bit of a murky day and very windy but still a stunning place to be. 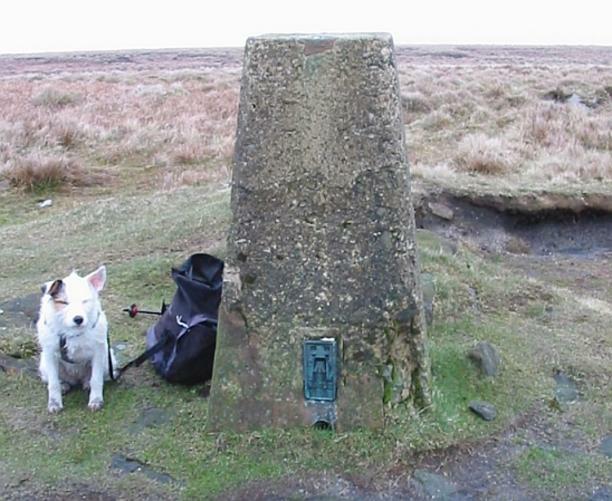 A Tad Windy The Pig next to Standedge trig point - wishing she was at home. Chunks missing from two bottom corners. It has a plastic plug into which someone has stuck a sharp pointed object. 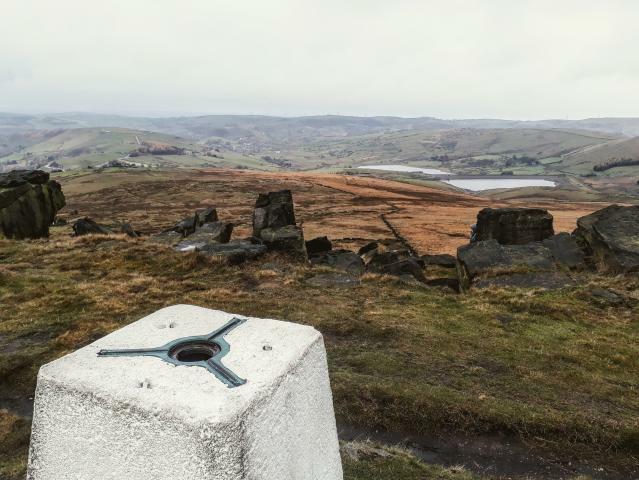 Good views over Delph and Castleshaw Resrs. Standedge View SW towards Castleshaw Resrs. 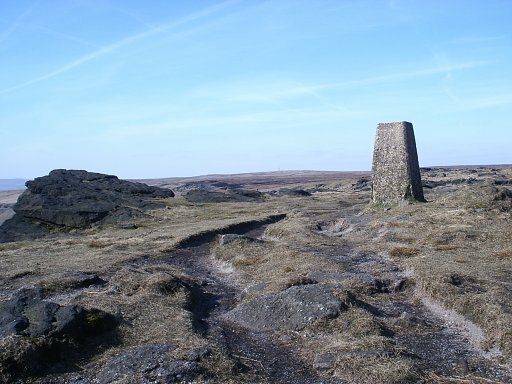 i know i went past on the PW, but cannot remember it, all i remember before howarth is peat bog, so for completeness, i visited again before logging. Chunks gone from 2 bottom corners. 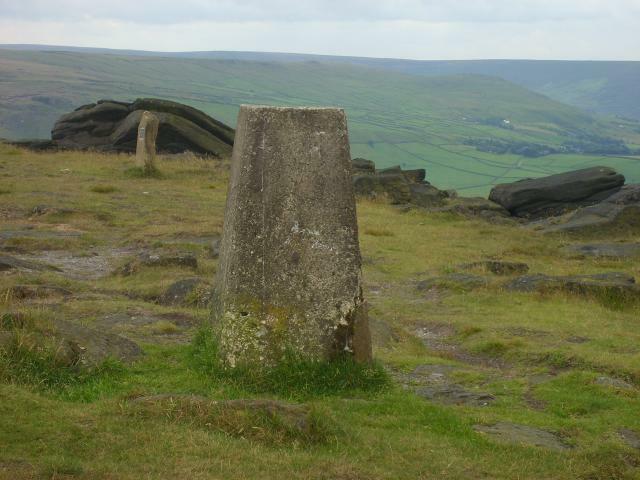 I love this exposed and rocky Millstone Edge. 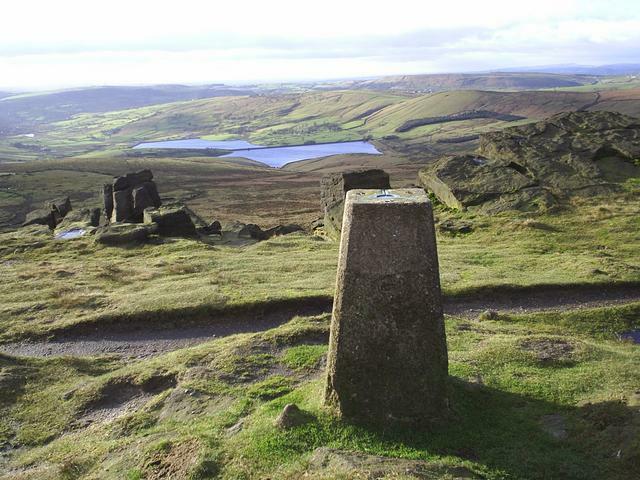 The views accross Castleshaw Reservoirs stretch out across Oldham and Manchester. Cold and windy today but clear. 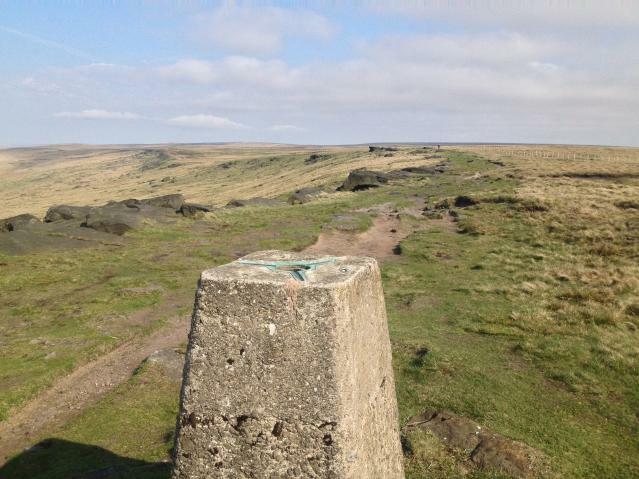 Standedge Looking North West towards Windy Hill. Standedge The view South West over Castleshaw Reservoirs. 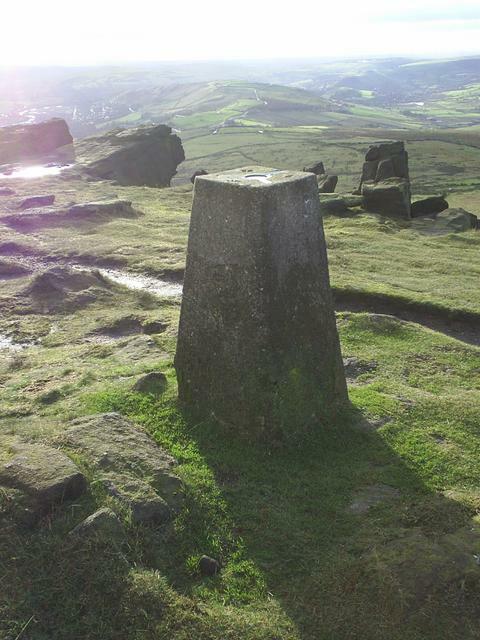 bagged this one from marsden,nice weather. Murky morning. 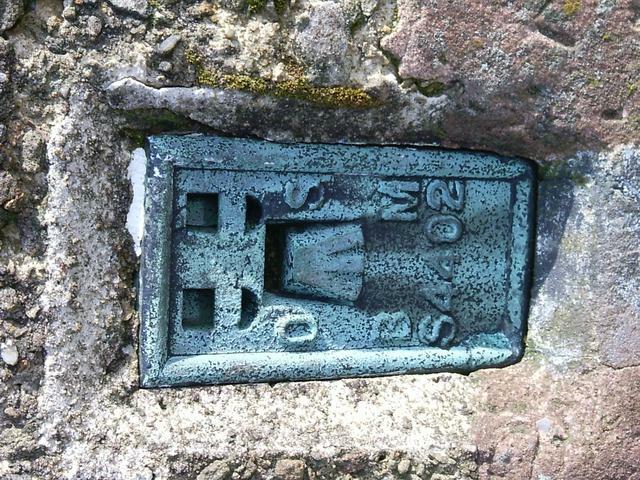 Small chunks out of pillar at base; some evidence of old repairs; plastic plug cover. Curlews calling. 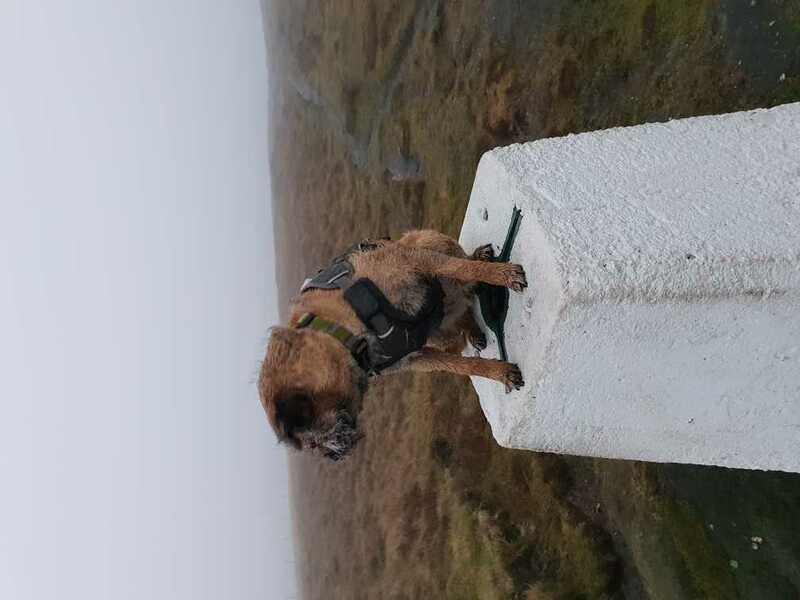 trig on a dull day. 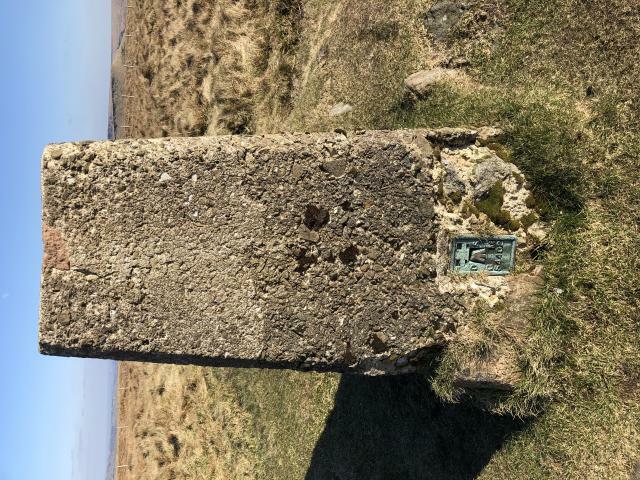 trig with memorial to Ammon Wrigley (local dialect poet). 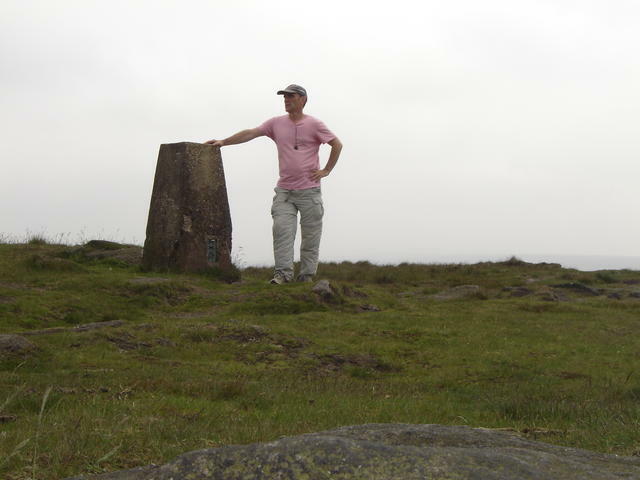 Millstone Edge (not too far from Marsden). 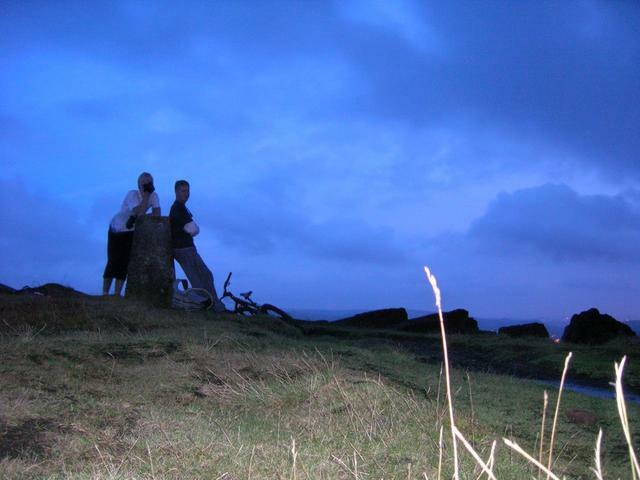 Good views towards Lancashire (Diggle). First visited (unrecorded) during the monsoon season, me and Sue (my wife) got absolutely drenched and saw next to nowt - and loved every minute of it ! 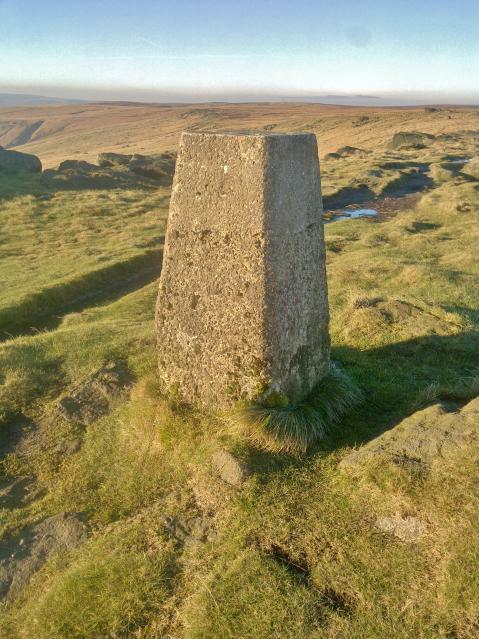 11 mile Marsden circular. Re-visited a number of times since. No cars, on foot. 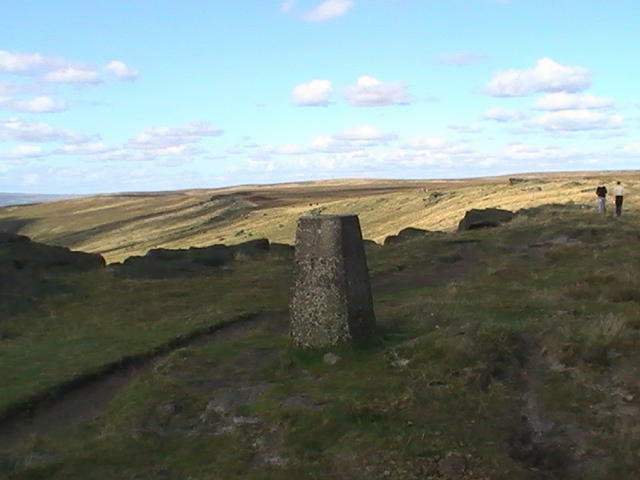 Views good to SW otherwise ruined by pylons etc. 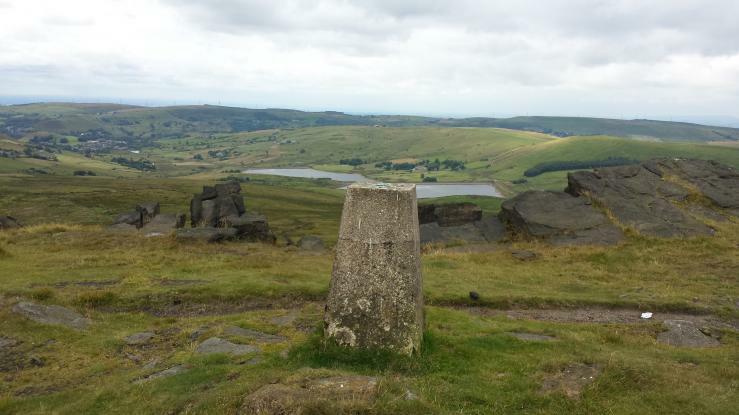 Reterolog from the Pennine Way. 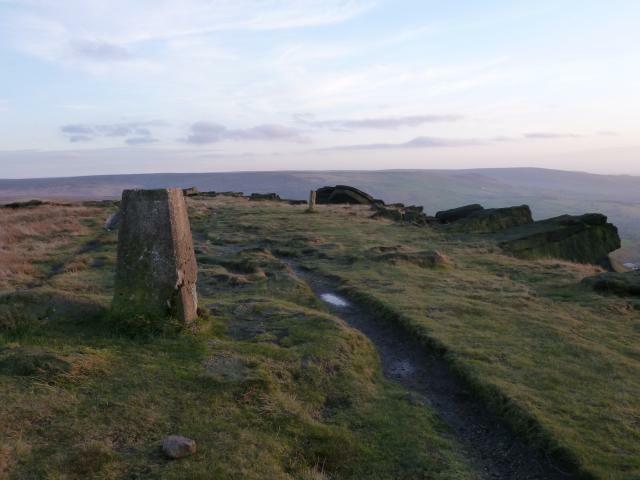 A showery day with a misty and clear periods. This was a misty period. Slight damage to the pillar. 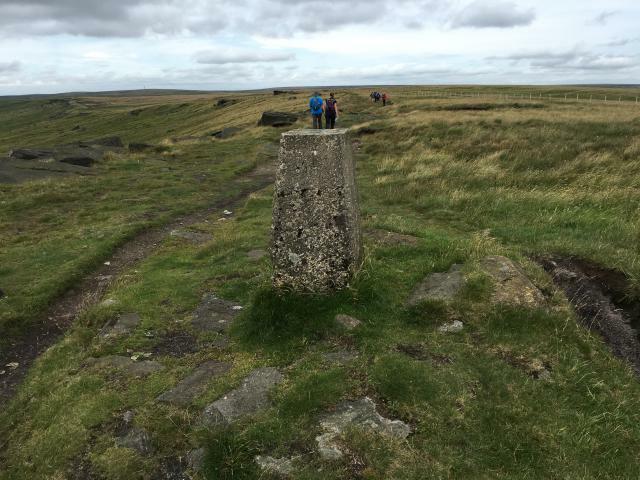 Another milestone on a rough Pennine Way day. The peat was becoming trying by now. 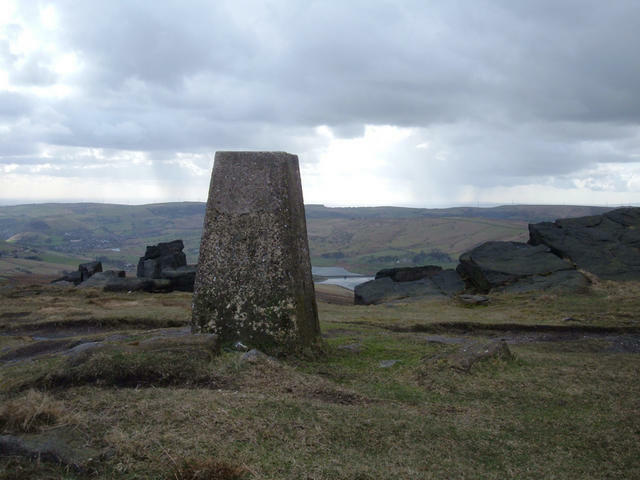 Visited during Pennine Way walk. Visited again on 24.7.14. 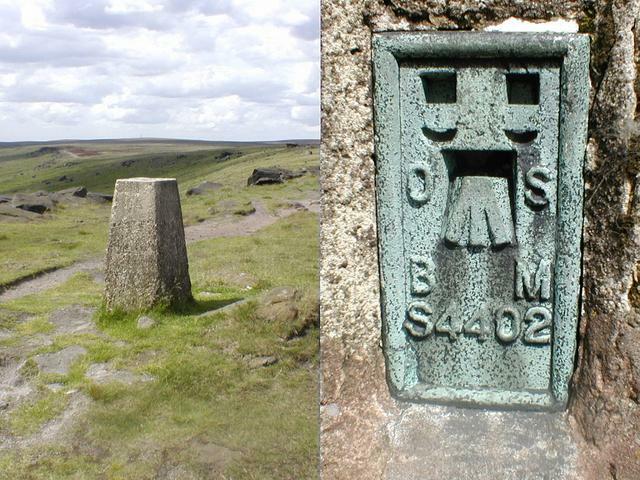 Cruised under it through the Standedge Tunnel on 17.8.06, and again 1.8.14.
aka Millstone Edge. 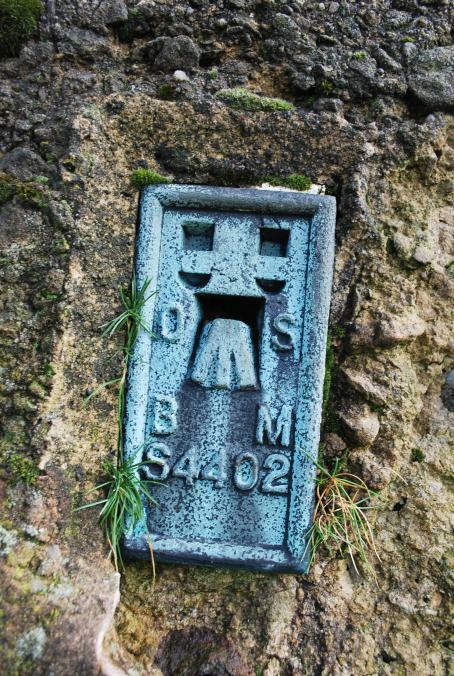 First encountered on Pennine Way. Several subsequent visits when we lived in the area. 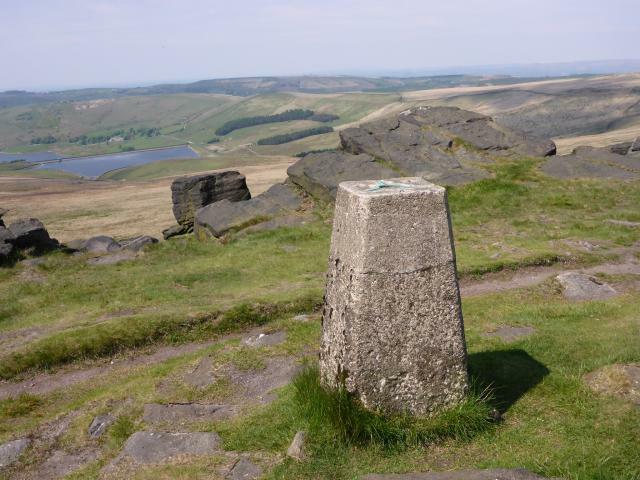 Park the car by Brun Clough reservoir and it makes an enjoyable short walk for children.